Willie Tanner, son of George Tanner and Lizzie Jones, husband of Elbie Clyde Abernathty. Elbie Clyde Abernathy, daughter of William Preasley Abernathy and Alice Howell, wife of Willie T. Tanner. Willie T. Tanner, 70, of Emerson, died Friday, June 8, 1990. 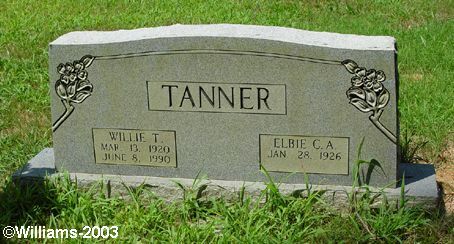 He was born march 13, 1920 in Bartow County, son of the late George Dave Tanner and Lizzie Jones Tanner, was of the Baptist faith and a veteran. Survivors include his widow, Elbie Abernathy Tanner, Emerson; one son, Walter Lonnie Tanner, Cartersville; three daughters, Judy Jeannette Cook, Stilesboro; Grace Ann Lowe, Cartersville; Reba Waits, Acworth; three sisters, Ruby Abernathy, Cleo Abernathy, both of Cartersville; Myrtice Hibbetts, Fairview; one brother, Claude Tanner, Cartersville; and 11 grandchildren. Funeral services were conducted Sunday at 2 p.m. from the Macedonia Primitive Baptist church with the Rev. Elihue Abernathy officiating. Interment was in the Old Macedonia Cemetery. Pallbearers were Doyle Abernathy, Daryl Abernathy, Lonnie Tanner, Jeffery Tanner, Timmy Cook and David Cook. Mrs. Elbie C. Tanner, 77, of 29 Pine Grove Church Road, Cartersville, passed away on Sunday, April 06, 2003 at her residence. She was born January 28, 1926 in Bartow County, the daughter of the late Presley Abernathy and Alice Howell Abernathy. She was of the Baptist faith. 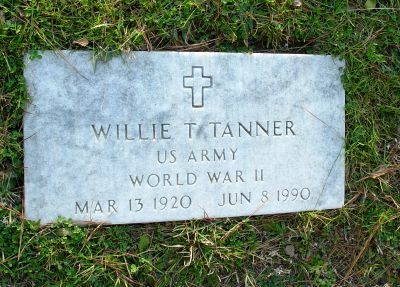 Preceding her in death are her parents, her husband, Willie T. Tanner, and one brother, Olin Hasting. Survivors include two daughters, Judy Cook and Ann Amyx; one son, Walter Tanner, all of Cartersville; 11 grandchildren and five great-grandchildren. Funeral services will be held on Tuesday, April 08 at 11 a.m. from the chapel of the Parnick Jennings Funeral Home with the Rev. Elihue Abernathy officiating. Interment will follow in Old Macedonia Cemetery. Pallbearers include Timmy and Wayne Cook, Jeffrey Tanner, Adam Amyx, John Lowe and Woodrow Wigley.